Abstract: The production of platform carbonates of the Manín Unit (Manín Straits, Central Western Carpathians) belonging to the Podhorie and Manín formations and formed by remains of rudists and benthic foraminifers (Urgonian-type carbonates), was previously assumed to terminate during the Aptian. First, we show that these deposits were primarily formed on the upper slope (Podhorie Formation) and in a fore-reef environment (Manín Formation). Second, biostratigraphic data indicate that the shallow-water production persisted up to the Albian, just as it did in another succession of the Manín Unit. The Podhorie Fm contains colomiellids (Colomiella recta, C. mexicana) and calcareous dinoflagellates (Calcisphaerula innominata) that indicate the Albian age. It also contains planktonic foraminifers (Ticinella roberti, Ticinella cf. primula, Ticinella cf. madecassiana, Ticinella cf. praeticinensis) of the Albian Ticinella primula Zone. The Podhorie Formation passes upwards into peri-reefal facies of the Manín Fm where we designate the Malý Manín Member on the basis of rudists shell fragments and redeposited orbitolinids. Microfacies associations share similarities with the Urgonian-type microfacies from Mediterranean Tethys and allow us to restrict the growth and the demise of the carbonate platform. δ13C and δ18O isotopes change over a broad range of both formations: δ13C is in the range +1.03 to +4.20 ‰ V-PDB and δ18O is in the range −0.14 to −5.55 ‰ V-PDB. Although a close correlation between δ13C and δ18O indicates diagenetic overprint, a long-term increase of δ13C can indicate a gradual increase in the aragonite production and/or increasing effects of oceanic water masses in the course of the Albian, prior to the final platform drowning. Carbonate platform evolution was connected with submarine slumps and debris flows leading to redeposition and accumulation of carbonate lithoclasts and bioclastic debris on the slope. 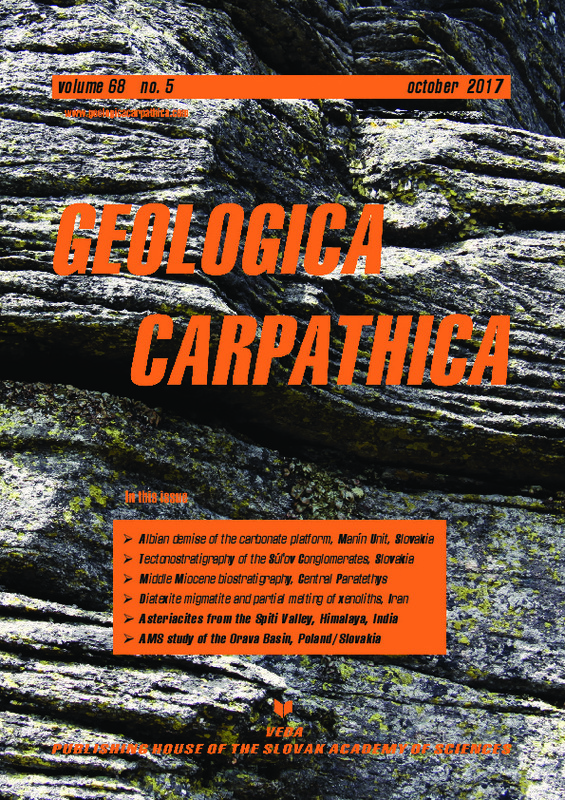 Our study confirms that the growth of carbonate platforms in the Central Western Carpathians was stopped and the platform collapsed during the Albian, in contrast to the westernmost Tethys. A hardground formed during the Late Albian is overlain by Albian – Cenomanian marls of the Butkov Formation with calcisphaerulid limestones characterized by planktonic foraminifers of the Parathalmanninella appenninica Zone and calcareous dinoflagellates of the Innominata Acme Zone.